The Hollywood community once again united to support Stand Up To Cancer (SU2C), a program of the Entertainment Industry Foundation (EIF), which staged its fifth biennial one-hour special on Friday, Sept. 9 (8:00 – 9:00 PM ET/PT / 7:00 PM CT). Academy Award-nominated actor and founder of the Bradley Charles Cooper Foundation, Bradley Cooper, served as executive producer along with renowned live, large-scale event producers Done + Dusted, in collaboration with the Stand Up To Cancer production team. Among those taking part were Vice President Joe Biden, Odette Annable, Will Arnett, Mel B, Kathy Bates, Mayim Bialik, Matt Bomer, Jordana Brewster, Danielle Campbell, Marcia Cross, Brittany Daniel, Viola Davis, Shannen Doherty, Dave Franco, Josh Gad, Greg Grunberg, Tony Hale, Tom Hanks, Ken Jeong, Anna Kendrick, Sonequa Martin-Green, Jillian Michaels, Robert Patrick, Rob Riggle, Jacob Soboroff, Brenda Song, Karla Souza, Emma Stone, Eric Stonestreet, Alison Sweeney, Bree Turner, Kristen Wiig, Charlie Wilson, Rita Wilson, SU2C Co-Founder Katie Couric, and social media personalities Brandon Armstrong, Grace Helbig, Joey Graceffa, Justine Ezarik, Harry Hudson, Brittani Louise Taylor, My Nguyen, Andrea Russett, Gemma Stafford attended and participated in the inspiring live broadcast. In addition, celebrated recording artist Celine Dion performed a moving tribute in honor of all those standing up to cancer. Alessia Cara, Charlie Puth, and Gallant delivered a musical performance. The telecast included appearances by Ben Affleck, Dierks Bentley, Lena Dunham, Chris Evans, Zach Galifianakis, Jon Hamm, Kevin Hart, Ed Helms, Eva Longoria, and Matthew McConaughey. The telecast broadcasted from The Music Center’s Walt Disney Concert Hall in downtown Los Angeles. ABC, CBS, FOX, and NBC, along with American Forces Network, ASPiRE, AUDIENCE Network, Bloomberg TV, Bravo, Comedy Central, Discovery Life, E! Entertainment, EPIX, ESPNEWS, FM, FS2, Fusion, FXM, Great American Country, HBO, HLN, ION Television, LMN, Logo, MLB Network, National Geographic, Pivot, RLTV, SHOWTIME, Smithsonian Channel, STARZ, STARZ ENCORE, TBS, Tr3s, VH1, and WGN America donated one hour of simultaneous commercial-free primetime for the telecast. For the first time, there was a Spanish version of the Stand Up To Cancer telecast airing nationally on Galavision, HBO Latino, STARZ ENCORE ESPAÑOL and Univision Deportes, and locally on Univision Puerto Rico. In addition, the show streamed live on SU2C’s Facebook page, Yahoo, SU2C’s YouTube page, MLB.com and in Spanish on Univision.com. USA Network aired the Stand Up To Cancer telecast on Friday, Sept. 9 at 11:00 PM – 12:00 AM ET/PT / 10:00 PM CT. The entire telecast will also become available to stream on Hulu beginning Saturday, Sept. 10. 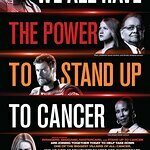 The first Canadian-inclusive SU2C telecast aired in 2014, and this year’s show once again aired across all four major English-language Canadian broadcasters: CBC, City, CTV, and Global. Additionally, Canadian services AMI, Bloomberg TV Canada, Blue Ant Media, CHCH, CHEK, Fight Network, Hollywood Suite, Joytv, NTV and TLN aired the telecast, the show streamed live on Yahoo Canada, and it will be available on-demand on shomi and TELUS Optik TV in Canada.